Please note: this product will freeze at low temperatures. If you live in a colder climate, there is a possibility it will arrive damaged during the winter months. We suggest calling us at 1-800-867-7258 to order overnight shipping to minimize this risk. 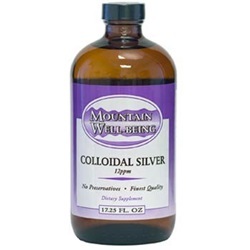 Colloidal silver is a health enhancer that acts as a powerful, all-natural antibiotic. It is comprised of submicroscopic particles of silver and silver ions that remain suspended, or “colloidal”, in distilled water by an electric charge placed on each particle. It is the most bioavailable form of the most effective germ killer known. While pharmaceutical antibiotics kill an average of 6 or 7 types of bacteria each, colloidal silver has been proven to kill over 650 different disease causing organisms at the UCLA Medical Labs. It is reported to be both a remedy and a preventative for colds, flu, and all infections caused by any bacteria, virus, fungus, or yeast. Also, it doesn’t taste bad, so it’s great for kids! This is the highest quality we’ve seen, made in a state-of-the-art modern facility. Each teaspoon supplies approximately 75 mcg (15ppm) of pure, electro-colloidal silver. Ingredients 15 ppm (75 mcg) silver per teaspoon. Suggested Use As a dietary supplement, take one teaspoon daily. When increased effectiveness is desired, one tablespoon may be taken a maximum of 3 times daily. Children can take half the recommended amount. Most effective on an empty stomach. For best results hold under tongue for 30 seconds before swallowing. No drug interactions.